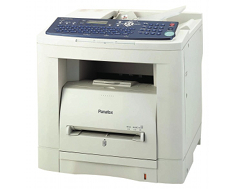 The Panasonic PanaFax UF-8000 is a great example of current fax technology. It not only transmits faxes with industry standard speed, but is capable of multifunctional tasks, such as digital scanning, as well. It utilizes Quick Scan technology and a built in 33.6 Kbps modem to optimize transmission speed at a rate of about 3 seconds per page. Using Panasonic's patented Quick Scan technology, the Panasonic PanaFax UF-8000 is capable of a fast 0.7 seconds single page scan; one of the fastest available today. The device also includes a built in automatic document feeder that has an oversized 100 sheet capacity, meaning that even huge fax projects can be loaded automatically. Panasonic's state of the art technology helps to prevent double feeding, pickup failures, and skewing, for the maximum possibly quality and consistency of fax projects. Single touch automatic dialing, along with a built in phone book that can include e mail addresses, makes fax transmission as fast as possible. There is also an incorporated set of dedicated buttons that can be assigned to a recipient address to reduce wait time for faxes to zero. Additional features such as network scanning, scan to e mail, scan to FTP, and scan to LAN are incorporated for user convenience, and also for PC faxing that could, potentially, save paper. The Panasonic PanaFax UF-8000's modem is equipped with JBIG technology, while an internal duplexor allows for not only double sided printing, but two sided faxes as well. Copy features are apparent in the Panasonic PanaFax UF-8000, though they are limited to some degree. Optional accessories include a G3 communication port, a document management system, and even a full size QWERTY keyboard. The device's paper handling abilities, along with duplexing, come in the form of a 500 sheet paper tray which is large for a fax machine. It also includes a 50 sheet multifunctional bypass slot that is perfect for printing to special media types without unloading one's regular paper supply. 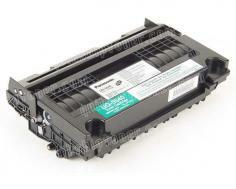 Print and copy speeds are lacking for the Panasonic PanaFax UF-8000, and top out at only 19 pages per minute. Included memory is also very limited. The device comes equipped with 12 MBs of build in RAM which buyers have the option of upgrading if slowdown due to intense print operations becomes a problem. Though the Panasonic PanaFax UF-8000 does go the extra mile to include scanning, printing, and copying as part of the standard hardware, it is still not up to par when compared to today's current multifunctional devices. The machine does not live up to its own price tag. Review it: "Panasonic PanaFax UF-8000 "
As far as toner supply is concerned, the Panasonic PanaFax UF-8000 leaves the buyer with two options: a standard cartridge and a high yield cartridge. Users have the option of purchasing a regular cartridge that can produce up to 5,000 pages or, for about ten dollars more, one can buy a high yield cartridge with a 10,000 page yield at 5% coverage. The high yield cartridges are a much better value.